When I read Ruchi’s debut book, ‘Bollywood Fiance for a day’, somehwere I read the next one was about Saira, I thought, how a villain (fiance-snatcher) can be depicted as a heroine? 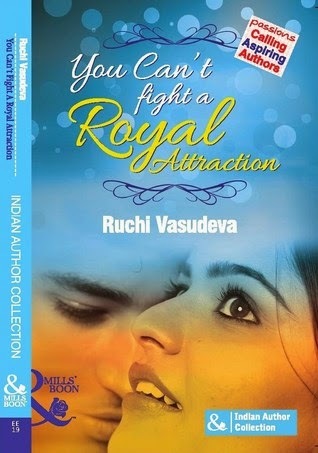 But Ruchi Vasudeva has pulled it off. And oh… so effortlessly and naturally. She made me forgive Saira and fall in love with the character. Saira’s situation authentically resonates the Indian joint family’s scenario, with a husband who couldn’t take a stand of his own. The first half is fantastic where Vishakha and Zaheer also make an appearance and Saira is trying to find her own identity and niche, aptly supported by Rihaan. I find her a mature person, trying not to take things for granted. The chemistry between the two, Saira and Rihaan, is passionate and sizzling, a hallmark of author’s style. The second half takes us to Rihaan’s part of the world, which is equally fascinating. The setting of Rajastani culture and the description of palace, holi festival, ethnic dresses made the story vividly colorful. The twist in Rihaan’s back story, where he is forced to leave his legacy and home, comes as a pleasant surprise. Being a Mills&Boons, where romance is an expected factor, the author has focused on the genuine insecuritites and conflicts between the two characters, bringing the resolution to a satisfying end. Highly recommended read. Next Post Recruits and Riots!